Mellor Nook's design is an important influence on the residents' qualify of life. The design has been geared to satisfying the needs of residents and staff providing care within the home while keeping the charm of a rural farmhouse. · Meets the standards relating to the design and fabric of residential care home required by law, regulations and directives. Over time, expectations have risen and standards are continually improving. Mellor Nook is committed in providing many of the features outlined here. 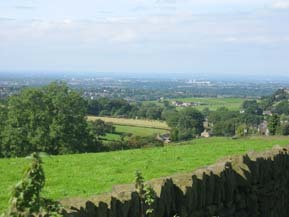 Mellor Nook maintains good community links. In some cases residents may be frail and unable to get out and about but they still value links with the local community, schools, community organisations and places of worship. If residents cannot get about by themselves, we have our own transport for outings and trips to shops and places of worship, and arrange for friends, relatives and volunteers to accompany them. Such help can also be arranged for relatives and friends who have no transport of their own and who cannot use public transport. Car parking for visitors (and residents in some cases) is also available. First impressions of Mellor Nook are its setting and the building itself. Open views on to gardens and the surrounding countryside are important. Mellor Nook has well designed landscaping and great pride is taken in all the grounds. Mellor Nook is a converted farm house which is very unusual for a care home but its this that makes Mellor Nook a totally individual and unique It is for this reason that at times it has been hard for Mellor Nook to comply with regulations to do with the building. However this is not taken as a reason to avoid meeting certain standards These are the standards which guarantee the privacy and dignity of residents, promote their independence and enable them to live their lives in the way that suits them best. Some standards are ruled by legislation, regulations and guidance; others are set by national associations (of the professions, homeowners and others) or are the outcome of agreement between Mellor Nook and inspection and registration units. 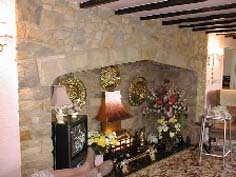 Since 1988 Mellor Nook has constantly improved the accommodation as and when possible, either as part of the development programme or, for example, redecorating between residencies. · Improving access to the garden and incorporating new features for example, the greenhouse, and raised flowerbeds. Our aim is, regardless of the overall size of the home, for life to be on a domestic scale for every resident. Residents are able to identify with a group of other residents within the home. · There are simple, obvious routes around the building, with points of interest as 'landmarks' (for example, plants or pieces of furniture) so that the individuals know where they are. · Long featureless corridors with similar-looking doors and dead-ends are confusing and don’t exist at Mellor Nook. · There is a stair lift to upper floors. · All specially designed fixtures and fittings, for example in toilets and bathrooms, are as much as possible in as domestic-style. 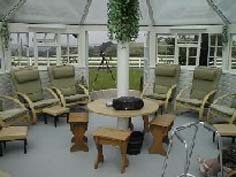 · A smaller lounge and the summerhouse as well as the larger lounge help people to mix with each other. · There is access to a safe and interesting garden with 'wandering' paths that is, a route which leads a person through the garden and back into the building unobtrusively. · A variety of usable spaces both inside and outside the building, some of which are semi-protected for example, porches, and summerhouse. The gardens at Mellor Nook are an important part of the premises. They are safe for people to walk in, without steps and accessible for wheelchairs. Security measures are unobtrusive but reliable. Seats at strategic points with sheltered and shaded areas enable residents to spend time outside. Raised flowerbeds, herb gardens and the greenhouse make it easier for residents to take an active interest in the garden.. People who are visually impaired value scented gardens. Birds and other wildlife are encouraged. Facilities and space that are shared by residents have been provided in domestic-style and are interesting and varied. Both communal space and personal accommodation is very important at Mellor Nook. The rooms are well decorated and accessible for everyone. Efforts have been made to ensure that common space is welcoming. For example, minimising noise so not disorientating people. · Fabric and furnishings are all fire-retardant. · Use of the dining room by residents, for large meetings with families and friends etc. · Provide a variety of spaces for sitting and looking out of a window. The single most important aspect of living in residential care is the living accommodation provided for the individual resident. All research shows that most residents prefer a single room. However some people do prefer to share a room they feel less alone and less vulnerable. People moving into Mellor Nook can chose to have their own single room accommodation (unless they prefer otherwise). We strongly recommended that shared rooms are available for couples; relatives or close friends are able to live together if they so wish. Two people only live in the same accommodation if they have chosen to do so. The accommodation is specifically designed for two people (in terms of size and facilities), paying due account to privacy. Careful design has reduced the amount of space taken from the living area of the accommodation although it must be recognised that installing en suite facilities into existing accommodation eats into available space and can therefore has only be done where practicable. There is a vanity unit and storage space for toiletries. Toilets are a comfortable height with built-in support. Taps designed for people with weak or arthritic hands have been fitted. There are a number of factors we have considered when designing the accommodation most were checked prior to registration and the following is what we took in to account. Some of which makes up the improvement programme. · Window(s) are of an adequate size are of good proportion in relation to size of room. all the window-sills are low enough for the resident to look out without obstructed vision when seated or when lying in bed. · Lockable strongbox for money and valuables. We recognise that Doors represent, both physically and psychologically, the entrance to a resident's private space therefore, that as far as possible the resident controls who enters, all residents are given a key and staff and visitors always knock and wait for an invitation to enter. Doors to resident’s rooms are lockable from both sides with staff holding a master key in case of emergency. As far as possible, residents hold their own keys with no restriction as to when they can lock the door. Doors are easy to open for people who are frail. Where appropriate, their wishes to keep doors open is respected. The outside of doors every residents room has their name and picture on it so that residents can easily recognise their own door. It is normal practice for people to bring some of their own suitable furniture with them when moving in on a permanent basis. They can decorate and furnish their rooms in their own style within reason if the wish. If not, they are freshly decorated by the home, although this may not be reasonable where the length of the previous residence has been very shor. If residents do not have their own furniture or if they are staying for a short period, then Mellor Nook provides suitable domestic furniture as described above. There is a straightforward, easy-to-use call system for both emergency situations and minor calls,. Once activated, the system indicates the origin of the call without disturbing other residents. But the staff constantly monitor the residents throughout the day and night (if agreed by the resident). Wherever possible, residents can control the environment in their own rooms. Mellor Nook s heating system maintains adequate temperature and complies with all safety regulations, and is controllable in each room. A resident is able to choose the temperature level in his or her own room and the system easy to understand and operate. Water temperature comply with safety regulations and checked regularly. All windows are easy to open with no risk of the resident falling out. The amount of air coming in is controllable. Size of openings conforms to building regulations in relation to rate of exchange of air within the room. There are curtains which residents can operate easily to provide privacy at night time and during the day when necessary. Different forms and type of lighting are available a main room light, bedside light and direct light over chair or table. 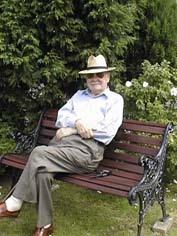 Account has been taken for a resident's reduced vision. Trailing flexes have been avoided where possible. During the coming decade, technology will become an integral, familiar and natural part of care provision. 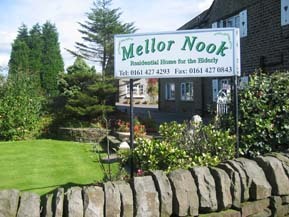 Mellor Nook attempts to keep up to date with new developments from which their residents and staff can benefit. · For coordination: for example, shared use of resident's records in the resident's room by all professional staff. These new technologies will increasingly be controlled by personal computers, which will make it possible to tailor the use of them to fit the individual care plan. It will also be possible to programme their use by prompting regular reviews. While the benefits will be enormous, there may be dangers, which we intend guarding against. The unethical use of technology is an infringement of residents' civil liberties and is regarded in the same way as restraint and abuse. · It will never be used solely for the convenience of staff. · Who agreed to its use and who will participate in the review.